It started off with a trip along and near the Rio Grande, with stops in El Paso, Presidio, Marfa, Fort Stockton, Alpine, Lajitas, Sonora, and Terlingua. Major focuses were to be food-restaurants, Halloween/Day of the Dead, history and local events. Then the visit to the Border Patrol Museum in El Paso took us off course. To hear about the history of the Border Patrol and the role played in the history of Texas made me all the more interested in this legendary enforcement agency. The Border Patrol Museum is a must-see when visiting El Paso. Admission is free. 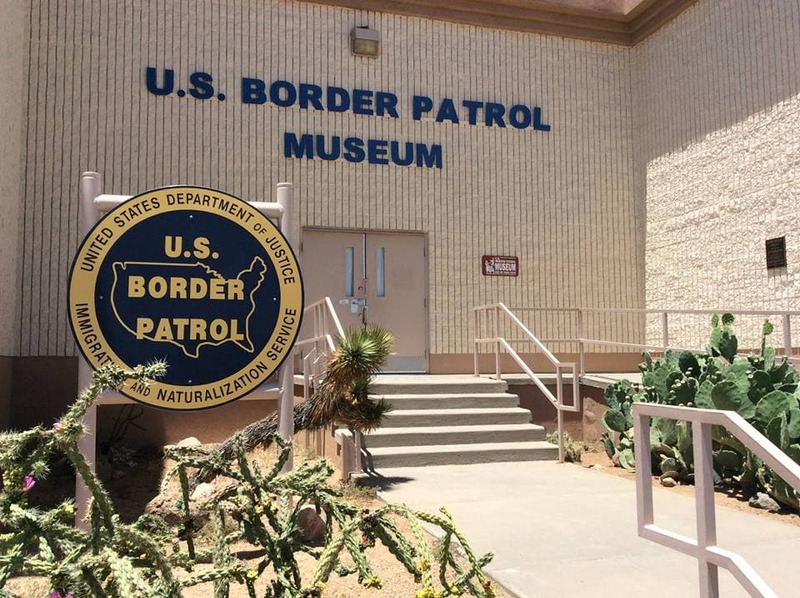 Spurred by our visit to the museum, I decided to find a Border Patrol Agent and to interview him-her about the current perils along the border. Next to the last day of our seven-day pilgrimage, out in the middle of the desert loaded with cactus, sage brush and hundreds of other moving creatures, sat a small, cantina-like grocery store. And on the front porch of the cantina, two border patrol agents were seated at a table, having their lunch. Without an announcement or invitation I sat down quickly by them. Just as quickly, right hands settled on their guns. I introduced myself as a writer who just wanted to get some impressions about the border situation. Not a word was said. One officer was a young Latino man, the other an older, 40-ish Anglo. For this column I will refer to them as Anglo and Latino. No one said a word, but at least they had removed their hands away from their guns. They just continued to sip their Grape Nehis while hiding behind their sunshades. “Hear you fellows been mistreating the poor Mexican immigrants trying to come to America for a better life,” I stated with all the self-righteous indignation of any writer from The New York Times or a CNN correspondent. The Latino took off his glasses and started to speak, but Anglo shook his head. Again silence, but Latino was turning red and his lower lip was quivering. “Well, just how bad are things down here?” I asked. “Bad,” they said in unison. “And getting worse,” added Latino. “Tell me what you can about the border situation,” I asked. “We cannot overcome this outside threat unless we have the support of the American people,” added Latino. “The bad guys like the division. They want us fighting against each other. They also know that if America doesn’t enforce her laws, then our days as a nation are numbered,” said Anglo. “Just how bad is it?” I asked. “Well, what do we need to do?” I ask. “Sure you want to know?” came the reply nearly in unison. “Yes tell me,” I said. “Pass laws that say everyone for whatever reason needs to come through a port of entry. If not and you are caught, back you go to your home country. Home country pays for the travel costs. Must first apply six months earlier for entry while in their home country before arriving at the border. Must present an official ID, immunization-health records, and work or skills record,” Anglo said. “Wait, wait, you are going too fast,” I said, raising my hand. “Without these documents, you are immediately sent back at home country’s expense. Any country allowing undocumented immigrants through their country without attempts to stop them will be fined $10,000 for each individual applying for amenity or residency,” Anglo said. “What about the US military on the border?” I ask. “Military more than welcome, except they need to be armed. The bad guys are already armed,” said Latino. Just about all the customers had left the store and only my car and the officers’ two trucks were left out front. They just smiled and headed towards their pickups. Just as I got back to my car, Latino pulled around and stopped. I went over to him and leaned through the open front passenger window. “Trump! Everyone I know voted for Trump,” he said. Durhl Caussey writes a column read in communities from coast to coast. He may be reached at this paper or dcaussey@sbcglobal.net.